Anthony Bourdain left behind a stash of polished writing for fans to discover and savor after his death on June 8. 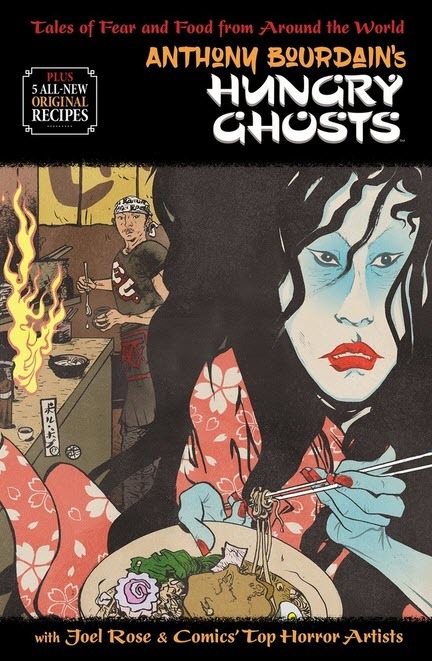 Anthony Bourdain’s Hungry Ghosts represents his final foray into the graphic novel genre with food-centric horror stories. The 128-page full-color hardcover is being released under the Berger Books imprint of Dark Horse Comics in Portland, Oregon, on October 2, retailing for $13.49. The book is a compilation of the four-story miniseries by the same name that Bourdain had published previously (which I haven’t read), as well as five new stories. The posthumous publication, illustrated by various artists, will include a tribute written by his collaborator Joel Rose, a full-page portrait of Tony, and five new recipes. Comic books were Bourdain’s first love, so it will be bittersweet to add this volume to the shelf beside his two Get Jiro! graphic novels. Anthony Bourdain’s Hungry Ghosts is available for pre-order from Amazon.com. And don’t forget, CNN begins airing the 12th and final season of Parts Unknown on Sunday, September 23. Open Letter to CNN: Cashing In On Bourdain? Anthony Bourdain fans mark today as exactly 10 weeks since we lost him to suicide while filming Parts Unknown in France. I was pleased this month when you announced that you and Zero Point Zero are putting together a final seven-hour Season 12 using remaining episodes Tony had filmed. You created a mystery by omitting Florence, which Tony completed with his then-girlfriend, Asia Argento, the week before he traveled to France. Yesterday, Vanity Fair broke the news that you’re planning a feature-length big-screen “definitive documentary” about Bourdain’s life and work. I’m quite familiar with this “hunger.” I wrote some blogs about Bourdain in 2007 and Cats Working suddenly became “Bourdain Central.” It remained so for several years until Tony took the plunge into social media himself. Cats Working has seen a resurgence since his death because readers knew I was covering him when few did, and I’ve promised now to tell his story until there’s nothing left to tell. The word “exquisite” has fluffed my tail. Because of your almost-nonexistent reporting on Bourdain’s passing, I expect the most disingenuous puff piece in the history of film. You cite fan interest as a factor in all your Bourdain-related decisions. What fans want to know is what really happened during Bourdain’s last week of life and why. The French authorities’ announcement on June 8 was so sketchy, yet 100% conclusive, it didn’t pass the smell test. Aside from a belated admission that Bourdain had alcohol in his system (How much? Who knows!) all we know is that he was cremated five days later (presumably without an autopsy), and his brother Chris received the ashes on June 15. Since then, there’s been nothing except unconfirmed stories on social media from unverifiable posters who claim to know something. CNN calls itself “The Most Trusted Name in News.” I used to believe that. But on this story about one of your own, instead of doing your job, you’ve filled the void with personal tributes to pass as news. So, CNN, why are you apparently boycotting Asia Argento? What’s your beef with her? Since Bourdain was your employee, can you shed any light on why his appearance and demeanor seemed to decline beginning in 2016? Or didn’t you notice, even though the progression was painfully evident the last few seasons of Parts Unknown? When he died a few weeks before his 62nd birthday, he looked 80. You must realize that Tony’s faithful fans have seen hundreds of hours of his globe-trotting. We’ve read reams of interviews discussing his personal and professional life. We’ve read his multiple books describing his travels and personal demons. What’s your documentary going to add to that? The only missing pieces I can think of are the true and full circumstances surrounding his unexpected and unexplained death. I can understand your desire to protect the family, particularly his daughter, but Bourdain didn’t die in a vacuum. Many people know something, even if your crackerjack reporters totally missed the story. Eventually the truth will come out. It would be nice if it came from “The Most Trusted Name in News.” But I fear your documentary is just a cynical ploy to cash in one last time on your biggest globally recognized talent. If so, shame on you. CNN has announced they and Anthony Bourdain’s production company, Zero Point Zero, are putting together a seven-episode final season (12) of Parts Unknown, to begin airing sometime this fall. Only one episode was completed with Tony’s voiceover, and he filmed it in Kenya with W. Kamau Bell, who hosts United Shades of America, also on CNN. The other locales are Texas, New York, Indonesia, Mexico and Spain. They will include Tony’s voice caught as he was filming, with any gaps filled in by crew from the shoots. The finale will be two hours long, with one hour a peek behind the scenes with the ZPZ crew, and the final hour a collection of past guests and fans discussing their relationships with and feelings about Bourdain and how he affected them and the world. What’s missing from this lineup is the episode Bourdain completed filming in late May, the week before he traveled to France and died there on June 8. Argento recently posted a photo of herself in a car with Tony, holding an umbrella against the sun, the last weekend of the Florence shoot. The following weekend, Argento would be photographed in Rome by two paparazzi in the company of a 28-year-old journalist named Hugo Clement. We may never know. Personally, I agree with CNN-ZPZ’s decision on every level. The last nomination has special significance for me because I’ve said before that Bourdain was becoming the “Susan Lucci of the Emmy for Outstanding Writing” after repeatedly being nominated but passed over. My fingers are crossed he finally nails it this year. Asia Argento appears in this Southern Italy episode, but if I remember correctly, she was an extra in meal scenes more than a content contributor. Undoubtedly a generous Bourdain gesture to give her more exposure to U.S. audiences. Although Tony said he considered it one of the highlights of his television career, the Parts Unknown episode in Hong Kong, presumably directed by Argento, did not make the cut for an Emmy. The Emmy ceremony is Monday, September 17, on NBC. AND: Yesterday, the LA Times recently ran an open letter to “anyone who loves Anthony Bourdain and what he stood for” asking us all to give Argento a pass on any role she may have played in his death. I only recognized four names among the signers, so I must admit I wasn’t terribly moved. Today should have been Anthony Bourdain’s 62nd birthday, but instead we’re still trying to learn the truth about why the hell he isn’t here to celebrate it, after taking his own life during a Parts Unknown filming in France on June 8. It appears alcohol played a bigger role than we knew. The day it happened, it seemed almost that the French dispatched Inspector Clouseau to investigate. Bourdain’s death was immediately ruled a suicide with no foul play implicated and his body was whisked off to a morgue. If only the French knew what fans and those close to Bourdain knew — he suffered from an inexplicable, self-destructive obsession with Italian actress Asia Argento, 42, one of the women who helped launch the movement to take down Harvey Weinstein. From the beginning, the stench of Argento’s dark, demented existence permeated the relationship, but Bourdain publicly and persistently extolled Argento’s “magnificence” and myriad virtues that few could see. The two-year affair culminated in two damning series of photos taken by separate paparazzi in Rome of Argento being flirty and intimate with a 28-year-old French journalist. Three days after the photos appeared online, Tony took his own life. Now this morning on the Today Show, NBC’s Stephanie Gosk reports the French are saying there were “significant traces of alcohol.” And that “there were signs he drank significantly the night before he was found” hanging in his hotel room. It doesn’t change the fact that Argento is still likely a major contributing factor, but it could indicate that Tony tried to self-medicate the pain of her publicly humiliating him and then taunting him on Instagram. When that didn’t work, he resorted to permanent oblivion. If he was suffering from depression, alcohol may have been what sent him over edge into the abyss. At this moment, I’m not seeing corroborating news reports to back up NBC, but I’m just putting it out here as another chapter of the story. To me it indicates there’s probably more yet to be revealed to help us understand. It’s now been two weeks since Anthony Bourdain’s June 8 suicide in Kaysersberg, France. He was found hanging in his hotel bathroom by the belt from his robe, and reports now say that he was discovered by the hotel receptionist, not friend Eric Ripert. The French authorities who investigated found no suspicious circumstances around his death, so the only testing they apparently did was to collect blood and urine samples for a toxicology report, whose results were announced yesterday. I remember Tony once saying that he took a statin for his cholesterol. Perhaps that’s what the trace of therapeutic medicine was. What we now know from this is that Tony’s thought process was not impaired by any substance when he decided to end his life. Exactly what his thoughts were, we’ll never know. Tony’s brother Chris received on June 15 Tony’s ashes and all of the belongings he had with him in France — this presumably included his electronic devices. If one of Tony’s last acts wasn’t to erase the history on his devices, Chris may hold the key to whomever Tony last communicated with and whatever writing he may have left behind. In the New York Times story, Tony’s mother Gladys said she was no fan of Tony’s tattoos, but she plans to have his tattoo artist put her son’s name on her wrist as a personal memorial. Asia Argento’s behavior on social media has swung between melancholy and defiance. Page Six provided a run-down. She’s working as a judge on X Factor for Sky Italia, filming in Turin. With input from the family, Chris is arranging a small private service for Tony. No public memorial is planned, but I’ve seen these stories of memorials popping up around the country. Brother Chris accompanied Tony for that episode. Marcus Zotter in Naples, Florida. Nathan Lyle and Brandon Barnhart in Pensacola, Florida. Jonas Never in Santa Monica, California. Eater has a preview of the Season 11 Parts Unknown finale in Bhutan. Warning: The opening of the clip is disturbing. And filmmaker Darren Aronofsky wrote about traveling with Tony to Madagascar several years ago, and also tagging along for this shoot in Bhutan. PS: Tony’s birthday is Monday, June 25. He would have been 62 years old.